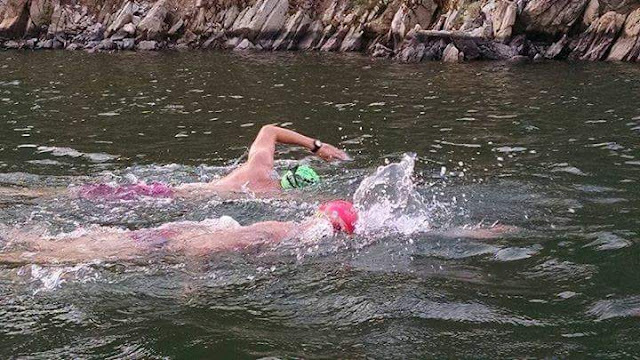 It's now three days after the Dam 2 Dam: The Great Moose Migration swim and I'm still sore. I had a blast this year, despite being sick the week before, and am already looking forward to next year. 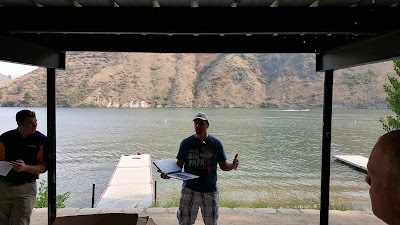 This will be a long, detailed race report (mostly so I can remember things) so if you don't want to ready the whole thing, here is the summary: It was hard. I finished. Checking out the starting line and wondering what I have gotten myself into. 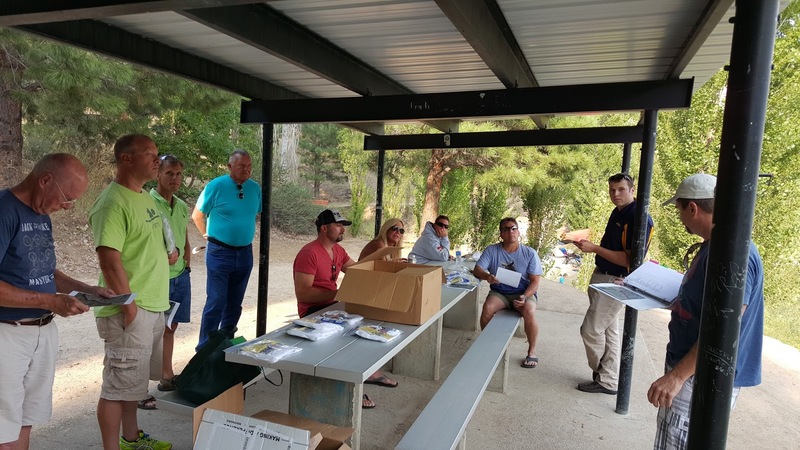 We arrived in Boise on Wednesday evening, set up our camp and explored. I hesitate to mention the name of the campground, because it was so awesome and we want to get a spot for next year :) We drove into Boise and got some late dinner for Sabrina's birthday. She was a good sport and spent most of her birthday driving in the car. She always supports me in my swims and I'm very thankful that she puts up with me. On Thursday morning, I got in the water at 7am at our campground to see what conditions would be like for the race on Friday. The water was calm, clear and about 68 degrees. It was pretty much how I remembered it being last year. 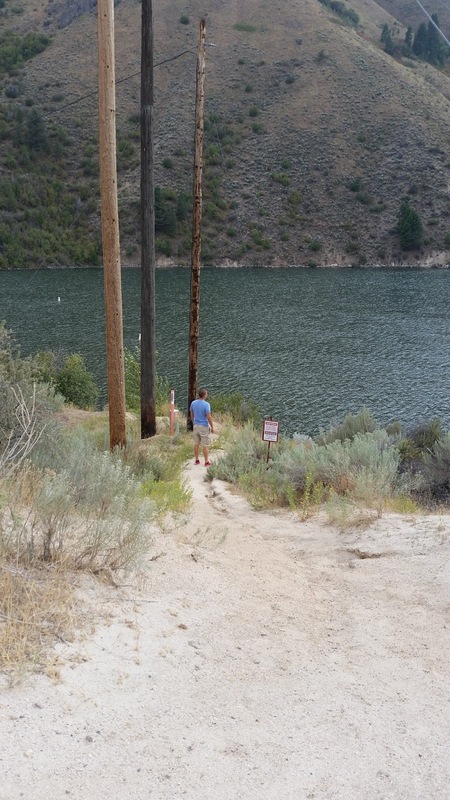 I later met with Kevin and Lloyd (Boise locals), Patti and Gigi (both from Texas) for a swim near Lucky Peak Dam, where the race would finish. We didn't go too far, maybe a bit over a mile. Water temp was around 70 degrees. It was fun to see Kevin again and to meet Lloyd, Patti and Gigi and hear about their swimming experiences. Patti has a lot of big swims under her belt and she was fast. I figured she was probably going to win the race on Friday. I also ran into Oscar (aka "Moosie") the event organizer on Thursday. We talked for a bit and agreed to use our campground as the meeting place for the pre-swim meeting later that night. Oscar is a great guy and has done a great job growing this event and improving it from year to year. Chad and his crew showed up and hung out at the campground for a while before the meeting. Sarah and Steve showed up right after the meeting got started. Oscar "Moosie" Williamson filling us in on the details of the swim. The meeting went well and it was nice to meet some of the other swimmers. Oscar filled us in on all the details, went over the course, safety procedures, and handed out the swag. 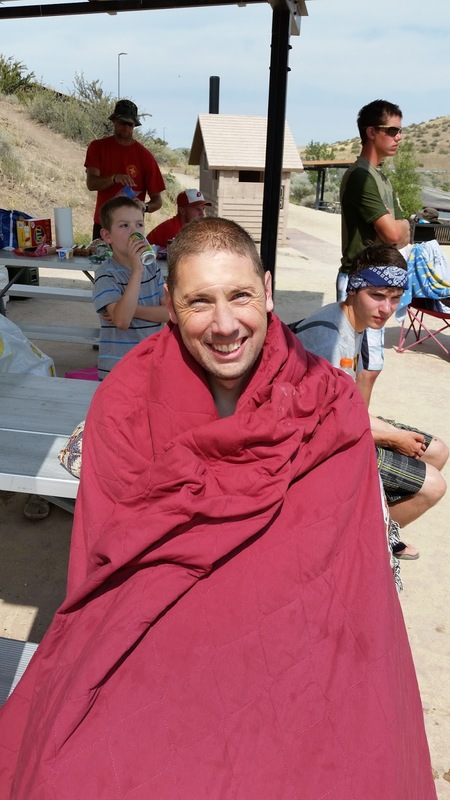 This year, he arranged to have some scouts (including one of his sons) paddle for a few of us out-of-state swimmers. They were camped right next to us (about 1 mile from the start) and we agreed that the easiest thing to do would be to meet up with them as we passed the campground. I would just toss all my stuff in with Chad's paddler Ryan and make the transfer when we got to the campground. I actually slept pretty well on Thursday night, which is unusual for me the day before a race. I am still getting over a cold that started the week before and wasn't feeling 100%. All of the long training swims I had planned leading up to the race had fallen through and I wasn't feeling as prepared as I wanted to be. I had been stressing myself out so much about this swim that I thought I would be up all night. Feeds prepped on Thursday night. 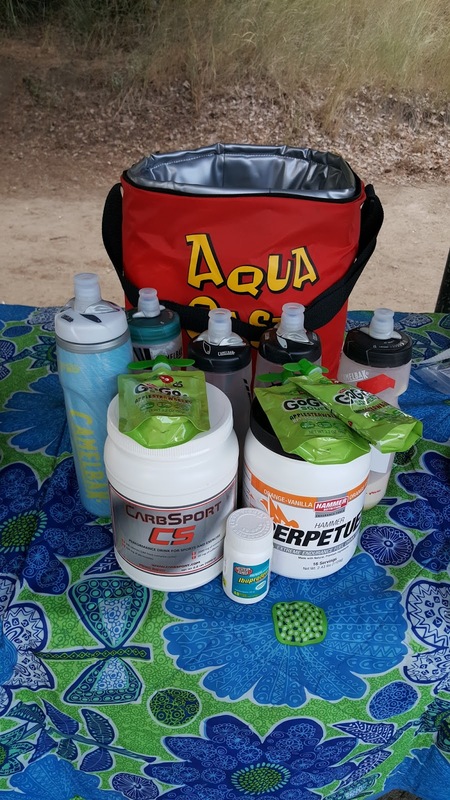 Main fuel was Perpetuem and was supplemented with CarbSport (a local Utah product), applesauce, and Ibuprofen. I had everything all ready to go so that I could just wake up on Friday morning and go pick up Chad and his crew. Chandra had agreed to drive my car back to the campground after dropping us off. 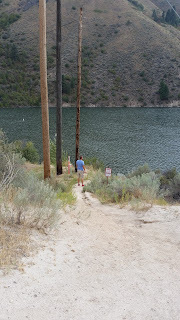 We were the first ones to the starting line and got Chad's kayak and supplies carried down the steep path to the starting area. It was a chilly morning and I tried to stay dressed as long as I could. We all headed down the water and I got greased up and ready to go. After a couple pictures, Moosie counted us down and we took off. The water felt cool, but I knew that was going to be the case. Chad told me he was going to try to keep up with me, but I was actually trying to keep up with him for the first half of the swim. We met up with my paddlers at about 1 mile into the swim and got my stuff transferred over. I told them about my feeding plan and started swimming. Last year I had some pain around mile 5 or 6 and I took too long taking Ibuprofen. This year I had planned to take 4 Ibuprofen and an applesauce at mile 5, but was feeling pretty good so I only took two Ibuprofen and no applesauce. This was a mistake and I started hurting around mile 7-8. This is the same sharp pain on my right collar bone that has been bugging me over the last few years. I think it came back because I had taken some time off of swimming when I was sick. I took 3 more Ibuprofen around mile 8 along with my regular feed and an packet of applesauce. The pain got much better in the last few miles. I should have just stuck to the plan and taken 4 Ibuprofen at mile 5. Great photo of Chad and I swimming together, taken by Chad's paddler Ryan. 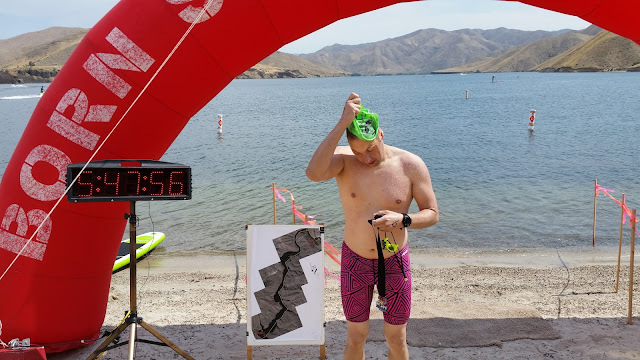 I was in a bad place mentally for the first half of the swim. I questioned why I was doing this and allowed myself to think about getting cold, even though I was fine. 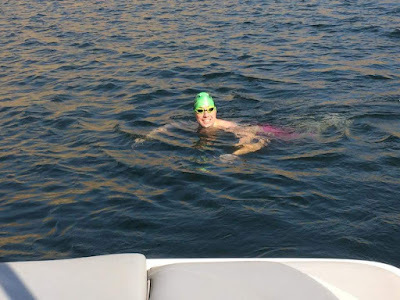 I forced myself to calm down and told myself that it was just my arms that were cold (this was true because the air temp was cooler than the water) and that I had finished last year under almost identical conditions and had been fine. It helped to be swimming next to Chad because I knew if something went wrong that he would know what to do. I ended up being fine. 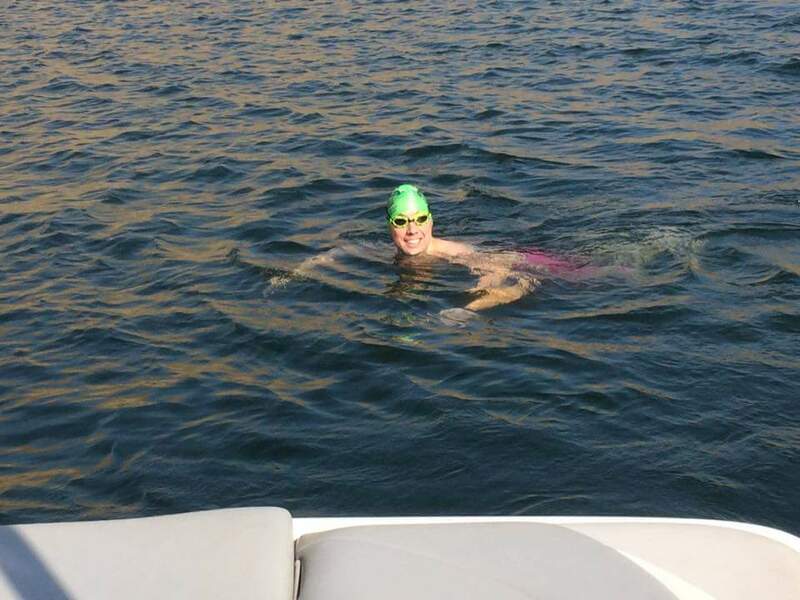 The water was cool enough that I never felt really comfortable, but I never shivered or anything and was just fine when I got out of the water. Photo taken by Oscar around mile 7-8 when I was coming out of a bad place mentally. Around mile 7, the negative thoughts started going away and I knew I was on the home stretch. I had seen the finisher medals, and they were awesome, and I wanted to be sure to earn one. 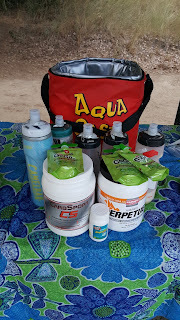 That was part of what got me through the tough parts of the swim. Mile 8 is the last turn and it's about 3+ mile straight shot to the finish. I had brought up one of our arches for Oscar to set up on the shore this year and I started to see it at around mile 9. I tried to force myself to not keep looking at it, because I knew it would make the last few miles seem to drag on forever, but I couldn't help it. I wanted to be done and kept looking. It was frustrating. The water gets a little choppier later in the day and that added to my frustration. The scouts were great at encouraging me and telling me that I was almost done. I felt like I had plenty of energy the whole time, just my arms got really tired and felt heavy for the last 3 miles. I looked at my watch at what I thought was mile 10 and it was just over 5 hours. I was doing better than I expected to do with being sick. I tried to push a little harder, hoping to finish around 5:30. It ended up being a little more than a mile away and I finished at 5:48. This was a little slower than last year, but was actually better than I was expecting to get. I wasn't cold, but Oscar insisted on bundling me up. I walked up under the arch and my family cheered for me. One of Oscar's sons gave me a medal and Oscar rushed me up to the picnic area and covered me with a towel and blanket. I wasn't shivering and felt fine, but I appreciated his concern. Sarah was already finished, dressed and had combed her hair. 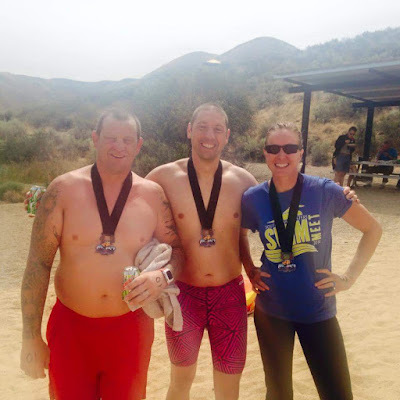 So fun to be able to do this swim with Chad and Sarah. Chad wasn't too far behind me and I went down to watch him finish. I'm so glad he came up to do this swim with me again. He's become a really good friend over the past couple years and I love swimming with him and teasing him. We hung around for a while and then had to go clean up our campsite. When we got back, the last swimmer and last two SUP racers were coming in. We took down the arch and clock that I had brought up and said our goodbyes. We left a little later than I wanted to (we had to get back for Deer Creek the next morning) and I'm hoping the dates work out next year that we can just relax and stay another night and head home on Saturday. This is a great event and I'm already trying to recruit people to go up next year. We should have a pretty good group of swimmers from Utah, plus some other out-of-state friends. Oscar does a great job of making the event fun and making the swimmers feel safe. I saw the support boats pass by quite often and knew that they would be close if something happened. If anyone is looking for a new swim to do for next year, I highly recommend this one.